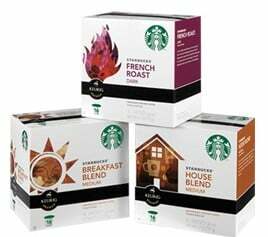 Click here to visit the Starbucks site and click the green button that says “Enter The Sweeps.” Then just fill out the forms to enter to win a year supply of K-Cups in the form of 52 coupons redeemable for one 10-count package of Starbucks K-Cup packs or Tazo K-Cup packs. You can enter everyday until September 30th and winners will be notified around November. Good luck all! Who doesn’t enjoy a GREAT cup of coffee in the morning? I love my Keurig and my KCups!!!! I love my Keurig and my KCups! They are the best! Me please!! We have a line item in our budget because my husband drinks so much coffee ;). I would love to have some free k-cups!!!! I love all types of drinks and it would be awesome to win this!!!!! I would like too win this for a year.That would be Great. Love coffee from the k-cups, southern pecan is the best!!! Give me, give me, give me!!!!!! Love, love my keurig and k cups! Keurig and KCups the best invention since sliced bread. Tea is usually my choice but my fiance’ enfoys a good cub of the brew in the morning…. I would so love to win this!! Cold weather just around the corner and to be able to curl up with a cup of K-Cups whenever I want would be awesome!! Thanks for the chance! I need some of these…. I would love to win this for a year and thank you for sharing with me and my fiends on fb today . With a family of coffee drinkers this would save my family some money over the coming months. I would love to win this. Starbucks and k cups what a great combination. I love my starbucks. Thank you for the chance to win a years supply. well apparently i am too old to enter the contest…then my sister tried and it let her…so i tried again and denied again…. Love love the kcups….makes it sooo easy for me a work…. One cup at a time!!!!! Love love love it!!! i am a mom of 3 teens all at college included myself too i look for my master’s education so is hard to work, help 3 students at college and husband fighting with cancer so these can be a great break for me. I would love to win this planning on buying a keurig soon and have family who already have one. this is the best contest ever!